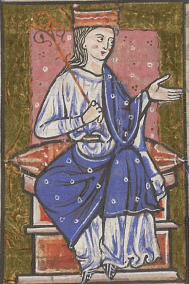 Æthelflæd, Lady o the Mercians (c. 870 – 12 June 918), ruled Mercia in the Inglis Midlands frae 911 until her deith. She wis the auldest dochter o Alfred the Great, keeng o the Anglo-Saxon kinrick o Wessex, and his wumman Ealhswith. Æthelflæd wis born anent 870 at the tip o the Viking invasions o Ingland. By 878 maist o Ingland wis unner Dens Viking rule, East Anglie an Northumbrie haein been ower haled, and Mercia parteetioned atween the Inglis and the Vikings, but in that year Alfred beird a crucial gree at the Fecht o Edington. Suin efterhaund the Inglis-guidit waster hauf o Mercia cam unner the rule o Æthelred, Laird o the Mercians, wha acceptit Alfred's owerlairdship. Alfred adopted the teetle Keeng o the Inglis, claiming tae rule aw Inglis fowk not leevin in airies unner Viking guidal. In the mid-880s, Alfred sealed the ference atween the Inglis kenricks by souderin Æthelflæd tae Æthelred. Æthelred played a major role in fechtin aff renewed Viking attacks in the 890s, thegither wi Æthelflæd's brither, the futur Keeng Edward the Elder. Æthelred and Æthelflæd fortifeed Worcester, gied lairge donations tae Mercian kirks and biggit a new minster in Gloucester. Æthelred's heal likely dwyned early in the neist decade, efter whit it is likely that Æthelflæd wis mainly wis the deed o the government o Mercia. Edward haed succeeded as Keeng o the Anglo-Saxons in 899, and in 909 he sent a Wast Saxon and Mercian force tae reive the northren Denlaw. They retoured wi the orrals o the ryal Northumbrie saunt, Oswald, whit war translated tae the new Gloucester minster. Æthelred dee'd in 911 and Æthelflæd then ruled Mercia as Leddy o the Mercians. The aiccession o a female ruler in Mercia is descrived by the historeean Ian Walker as "ane o the maist unique events in early medieval history". Alfred haed biggit a netwark o fortifeed burhs and in the 910s Edward and Æthelflæd stairtit on a programme o eikin thaim. Amang the touns whaur she biggit defences war Bridgnorth, Tamworth, Stafford, Warwick, Chirbury and Runcorn. In 917 she sent an airmy tae captur Derby, the first o the Five Boroughs o the Denlaw tae faw tae the Inglis, a veectory descrived by Tim Clarkson as "her geyest trumph". In 918 Leicester surrendered without a fecht. Suin efterhaunds the Viking leaders o York offered her their lealtie, but she dee'd on 12 Juin 918 afore she coud buit the offer, and a few months later Edward throu the vinkish o Mercia. Æthelflæd wis succeeded by her dochter Ælfwynn, but in December Edward teuk personal guidal o Mercia and cairit Ælfwynn aff tae Wessex. Historeeans differ whether Mercia wis an sequestrate kenrick unner Æthelred and Ætheflæd but they gree that Æthelflæd wis a gey ruler wha played an important pairt in the vinkish o the Denlaw. She wis praised by Anglo-Norman chroniclers sic as William o Malmesbury, wha descrived her as "a pouerfu aiccession tae [Edward's] pairty, the delite o his subjects, the dreid o his enemies, a wifie o eikit sowel". BY Pauline Stafford's wey o it, "like ... Elizabeth I she becam a wunner tae later eilds". In Nick Higham's view, medieval and modren writers hae been so captivated by her that Edward's reputation haes tholed unrichtly in confeerance. This page wis last eeditit on 6 Juin 2018, at 18:01.